18-3-203. 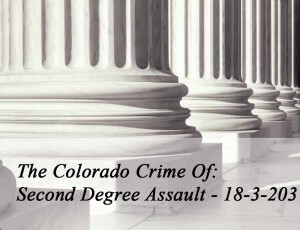 Assault in the second degree. specified time is deemed to be in custody. or expelling such fluid or material. Colorado or any political subdivision of the state of Colorado. does not include a person lawfully confined in a detention facility. sufficient for the voice of reason and humanity to be heard, it is a class 6 felony. (a) of this subsection (2), it is a class 4 felony. or class 3 felony sexual assault on a child. convicted of the charged offense. 6. by means of a deadly weapon. 6. caused bodily injury to any person. 6. caused serious bodily injury to any person.